an active 10-digit phone # will be required for ordering. Please read these Terms and Conditions ("Terms", "Agreement", "Terms and Conditions") carefully before using the https://www.cartana.net https://cartana.co, the web sites created for the restaurants or stores ("Vendor") that fulfill the orders, the Cartana mobile applications and the Cartana POS devices (the "Services", "the Sites") operated by Cartana LLC ("Cartana"). By accessing or using the Services you agree to be bound by these Terms. If you disagree with any part of the terms then you may not access the Services. You may only use the Services to order if you are the authorized holder of the credit card used for payment or an authorized user of a corporate account and if you are able to form a binding contract with us. In addition, if you are a minor in the jurisdiction in which you reside (generally under the age of 18), you must have the permission of, and be directly supervised by, your parent or legal guardian to use the Service, and your parent or legal guardian must read and agree to this Agreement prior to your using the Service. Notwithstanding the foregoing, you are prohibited from using the Service if you are under the age of 13. Use of the Sites to order requires that you register and/or create an account ("Account"). To register and create an Account, you must create a username and password and provide certain personal information. In consideration of the use of the Sites' services, you agree to: (a) provide true, accurate, current and complete information about yourself as prompted by the registration form, and (b) maintain and promptly update the personal information you provide to keep it true, accurate, current and complete. If you provide any information that is untrue, inaccurate, not current or incomplete, or Cartana has reasonable grounds to suspect that such information is untrue, inaccurate, not current or incomplete, Cartana has the right to block your current or future use of the Sites (or any portion thereof). You are responsible for maintaining the confidentiality and security of your Account and password and for all activities or any other actions that occur under or are taken in connection with your password or Account. You agree to (a) immediately notify Cartana of any known or suspected unauthorized use(s) of your password or Account, or any known or suspected breach of security, including loss, theft, or unauthorized disclosure of your password or credit card information; and (b) ensure that you exit from your Account at the end of each session. Cartana will not be liable for any injury, loss or damage of any kind arising from or relating to your failure to comply with (a) and (b) or for any acts or omissions by you or someone else using your Account and/or password. When you place a Pickup or Delivery Order, you may choose the time you would like your Order to be picked up or delivered to you. This time is only an estimate and Cartana offers no guarantee by this time. Cartana is not responsible for any delays in receiving your Order for any reason. If you have ordered alcohol, you must be of legal age to consume alcohol in the area in which the alcohol is delivered. The right is reserved of Vendor to require, valid government-issued photo identification, matching the name on the order, proving your age to the courier and that the recipient will not be intoxicated when receiving delivery. If you are unable to meet these conditions to the satisfaction of the Merchant then delivery of the alcohol products will be withheld, and any refund for such withholding is solely at the discretion of the Vendor. For the online ordering, we accept Visa, MasterCard, American Express, and Discover credit card if the Vendor chooses online payment. In order to protect our customers from credit card fraud, the billing address on your order form must match the billing address to which your monthly credit card statement is mailed. All Cartana online transactions are secured with industry-standard SSL data encryption that supports 128-bit encryption. If an order is not paid online, you must pay at the restaurant or pay the driver who delivers the order. You are obligated to pay for the order you made using the Sites unless the Vendor cancels the order. Unless prohibited by law, in the event of any error in your order or the amount you were charged, you are entitled to a credit, provided it is brought to our attention within 60 days of your order date. If you do not raise the issue within 60 days of your order date, you waive the ability to receive a credit for any error. Cartana reserves the right, in its sole discretion, to modify the Services from time to time and without notice, including, without limitation, by removing, adding, or modifying portions of the Sites, restaurants, and/or Vendors. Cartana shall have no liability to you for any of the foregoing actions. If you object to any such changes, your sole recourse shall be to cease using the Services. Continued use of the Services following any such changes shall indicate your acknowledgment of such changes and satisfaction with all the Services. All information, data, text, software, music, sound, photographs, graphics, video, messages or other materials, whether publicly posted or privately transmitted to the Sites by viewers or users ("User Content"), is the sole responsibility of such viewers or users. This means that the viewer or user, and not Cartana, are entirely responsible for all such material uploaded, posted, emailed, transmitted or otherwise made available by using the Services. Cartana does not control or actively monitor User Content and, as such, does not guarantee the accuracy, integrity or quality of such content. Users acknowledge that by using the Service, they may be exposed to materials that are offensive, indecent or objectionable. Under no circumstances will Cartana be liable in any way for any materials, including, but not limited to, for any errors or omissions in any materials or any defects or errors in any printing or manufacturing, or for any loss or damage of any kind incurred as a result of the viewing or use of any materials posted, emailed, transmitted or otherwise made available via the Services. The Services may contain links to third-party web sites or services that are not owned or controlled by Cartana. Cartana has no control over, and assumes no responsibility for, the content, privacy policies, or practices of any third party web sites or services. You further acknowledge and agree that Cartana shall not be responsible or liable, directly or indirectly, for any damage or loss caused or alleged to be caused by or in connection with use of or reliance on any such content, goods or services available on or through any such web sites or services. All pricing subject to change. For all prices, products and offers, Cartana reserves the right to make adjustments due to changing market conditions, vendor discontinuation, manufacturer price changes, errors in advertisements and other extenuating circumstances. While Cartana uses reasonable efforts to include accurate and up-to-date information on the Sites, Cartana makes no warranties or representations as to the Site's accuracy. Cartana assumes no liability or responsibility for any errors or omissions in the content on the Sites. It is the Cartana member's responsibility to read and understand the terms and conditions regarding the Reward Program provided by participating Vendor, outlined below. Rewards Points are NOT redeemable for cash. Only Cartana registered members can participate in the Reward Program and earn reward points at participating restaurants. Reward Points are not awarded until the order at the participating restaurant has been completed (i.e., the member has paid for the order). Cartana reserves the right to terminate a member's account and cancel accrued Reward Points if Cartana believes, in its sole discretion, that the member is abusing the Reward Program, or is misrepresenting any information furnished to Cartana. Any Cartana member who fails at any time to earn Reward Points for a period of 180 days is subject to termination of his or her membership and forfeiture of all accrued Reward Points. Should Cartana offer rewards from any partners, Cartana will not be responsible for any partner's participation in or withdrawal from Reward Program. Reward Points earned by a member in two or more different accounts cannot be combined to redeem any award. Members are solely responsible for any tax liability related to participation in Reward Program. Inquiries regarding the Cartana Reward Points assigned to a restaurant must be submitted via email within 14 days after the dine-in date in order to be considered for review by Cartana. If you need further information or clarification, please contact us via email using the online form provided at the end of this page. The features, information, and materials provided and depicted through the Services are protected by copyright, trademark, patent, and other intellectual property laws. 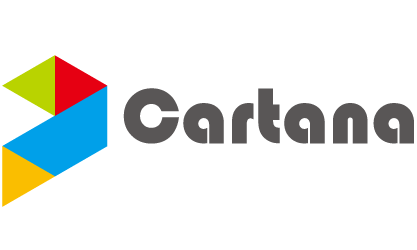 All text, graphical content, video, data, and other content made available through the Services (collectively, the "Cartana Content" ) are provided to User by Cartana or its partners or licensors solely to support User's permitted use of the Services. The Cartana Content may be modified from time to time by Cartana in its sole discretion. Except as expressly set forth herein, no license is granted to User for any other purpose, and any other use of the Services or the Cartana Content by User shall constitute a material breach of this Agreement. Cartana and its partners or licensors retain all rights in the Services and Cartana Content and any associated patents, trademarks, copyrights, mask work rights, trade secrets, or other intellectual property rights. No license, right, or interest in any trademarks of Cartana or any third party is granted under this Agreement. Cartana reserves the right to seek all remedies available at law and in equity for violations of the Agreement, including without limitation the right to block access to the Sites from a particular account, device and/or IP address. You acknowledge and agree that your access to and/or use of the Sites, the Materials and other content on the Sites is subject to all applicable international, federal, state and local laws and regulations. The terms, conditions and policies contained in this Agreement shall be governed by and construed in accordance with the laws of the State of Ohio, without regard to its conflict of laws principles. If you have any questions about these Terms, please click contact us. 1.What Types of Information Do We and Our Third Party Service Providers Collect From You? Non-Personal Information (or "Non-PII") is aggregated information, demographic information and any other information that does not uniquely identify you. We and our third party service providers may collect your Non-Personal Information, including information about the device you are using in accessing and/or using the Sites, information from referring web sites, and your interaction with the Sites. We and our third party service providers may also aggregate Personal Information in a manner such that the end-product does not uniquely identify you or any other user of the Sites, for example, by using Personal Information to calculate the percentage of our users who have a particular telephone area code. This collective information constitutes Non-Personal Information. Non-Personal Information. Because your Non-Personal Information does not personally identify you, we and our third party service providers may use such information for any purpose. For example, we may work with third parties for the purpose of advertisement delivery on the Sites, including online behavioral advertising ("OBA") and multi-site advertising. The Non-Personal Information collected about your visits to the Sites may be used by third parties in order to provide advertisements about goods and services of interest to you. These third parties may also set cookies or web beacons to assist with advertisement delivery services. 3.Other Important Notices Regarding Our Privacy Practices. Forums and Profiles. We and our third party service providers may make available through the Sites certain services (for example, message boards, reviews, chat functionality, "profile pages" and blogs) to which you may be able to post information and materials. Please note that any information you provide in connection with such services may become public, and may be available to visitors to the Sites and to the general public, including without limitation the ratings and reviews that accompany many restaurant listings and the comments section of our blog posts. We urge you to exercise discretion and caution when deciding to disclose your Personal Information, and/or any other information and/or materials, on the Sites. NEITHER WE, NOR ANY OF OUR THIRD PARTY SERVICE PROVIDERS, NOR ANY OTHER PERSON OR ENTITY DULY AUTHORIZED BY US AND/OR BY OUR THIRD PARTY SERVICE PROVIDERS, IS OR SHALL BE RESPONSIBLE FOR ANY USE BY ANY UNAUTHORIZED PERSON OR ENTITY OF ANY PERSONAL INFORMATION YOU DISCLOSE THROUGH THE SITES. Unsubscribe. If you do not wish to receive marketing-related emails or SMS text linked web pages from us, you may unsubscribe from receiving them by clicking on the "unsubscribe" link at the bottom of any of those emails or the web pages linked by URL within the SMS message. Changing Personal Information. You may review, correct and/or update certain elements of your Personal Information by adjusting your preferences in the "Setting->Update Your Profile" section of cartana.co. We and our third party service providers are not responsible for altering Personal Information from the databases and/or other records of third parties with whom we and our third party service providers have shared your Personal Information. California Privacy Rights. If you are a user of the Sites and a California resident, California's "Shine the Light" law (California Civil Code 1798.83) permits you to request and obtain from us once a year, free of charge, information regarding our disclosure of your Personal Information (if any) to third parties for direct marketing purposes. If this law applies to you and you would like to make such a request, please submit your request in writing to the address provided below.